NEW!! UNIQUE!! EXCLUSIVE !! Aramaic translator with 3 dictionaries for the price of 1!The only electronic dictionary that includes an Aramaic/English, Aramaic/Hebrew. Special Bonus: Hebrew - English Speaking Dictionary. Based on The Melamed Dictionary, and including Talmudic source. Newly developed, this dictionary will help to translate from Aramaic to English & vice versa. The Aramaic is presented in the original ancient writings (Hebrew letters). The Next Generation is here - Learn Aramaic quickly and easily with this second generation of the Speaking Dictionary. Loud and clear human voice pronunciation in Hebrew. Hebrew / Aramaic - Aramaic / Hebrew Dictionary (Melamed) - including Talmudic source. Now you can translate to Hebrew or English when learning Gemorah. Also serves as an English/Hebrew speaking dictionary. The dictionary contains 900,000 words and phrases and can pronounce each word in Hebrew on demand (Only for the General Terms ). The phrase book is divided into ten different topics for easy reference, ranging from phrases useful at the airport and stores to changing money or visiting the doctor. Produced especially for web sales - not available in stores. This unique product is now available to the public for the first time. 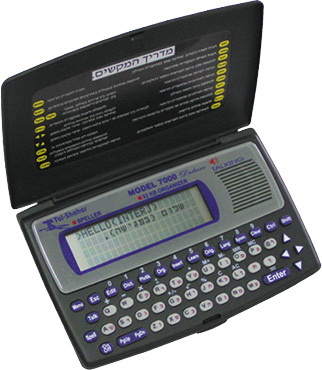 The only electronic dictionary that translates for you and allows you to hear the word in Hebrew in a natural human voice (Only for General Terms ). The Speaking Dictionary is a compact folding state-of-the-art piece of electronics (size 9.5 x 15 cm / 3.8 inch x 6 inch). It contains a dictionary, a talking phrase book, an organizer, diary, alarm clock, telephone and address book. It operates with 3 AAA batteries + an adapter (suitable for US or Europe/Israel electrical systems), included in the package.